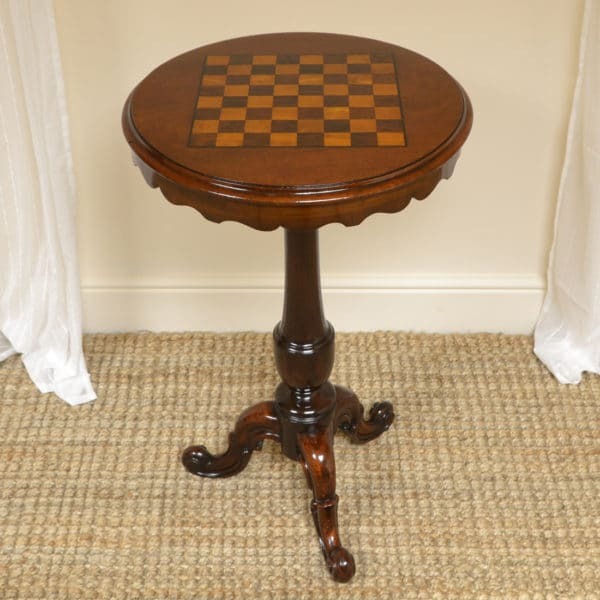 During the Victorian period Antique Chess tables were high in fashion as chess was a great way of entertainment. The Game of chess dates back over 1000 years, but was popular in Europe and especially in Britain in the 19th century as new tournaments were introduced along with chess clocks in 1883 along with the first world chess championship in 1886. 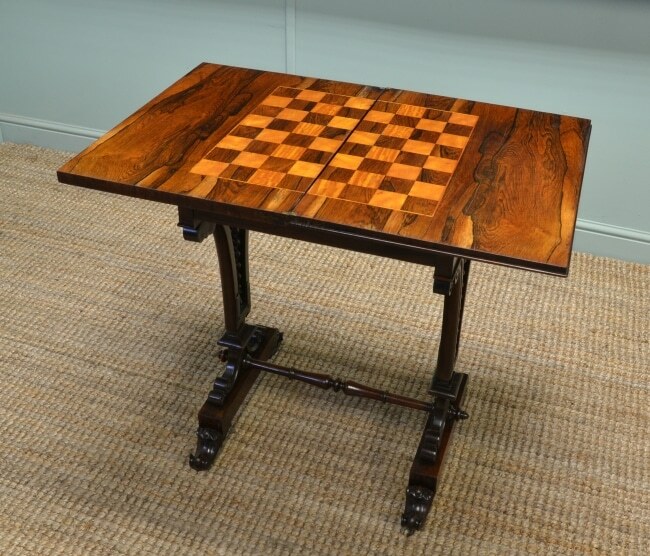 This lead to a rise in demand for new chess boards and this is why inlaid chess tables became so popular in the Victorian home. As these were used by the wealthy, no expense was spared in their construction, with beautifully figured walnut or fine inlaid rosewoods used, often with boxwood and ebony inlaid squares. 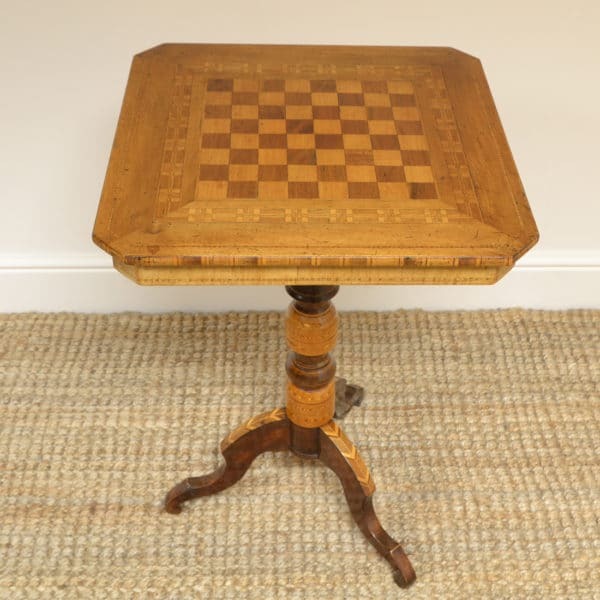 Have a look below at our lovely examples of antique Chess tables along with other games tables, available for sale and if we do not currently have what you are looking for, let us know and we can add you onto our wanted file. You can also join our mailing list and this will update you with newly added stock. Spectacular Quality Figured Burr Walnut Tunbridge Inlaid Victorian Antique Games Table Work Box. Below are a few examples of chess tables that we have sold, if any particular style looks of interest, let us know and we can try to find you something similar. 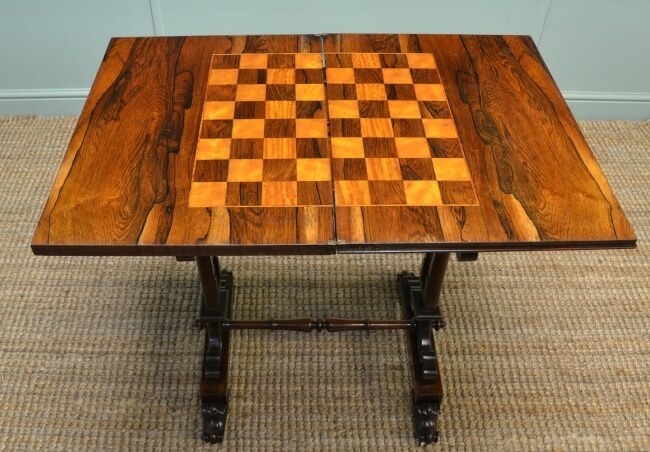 Antique Victorian Rosewood Chess Table / Occasional Table. 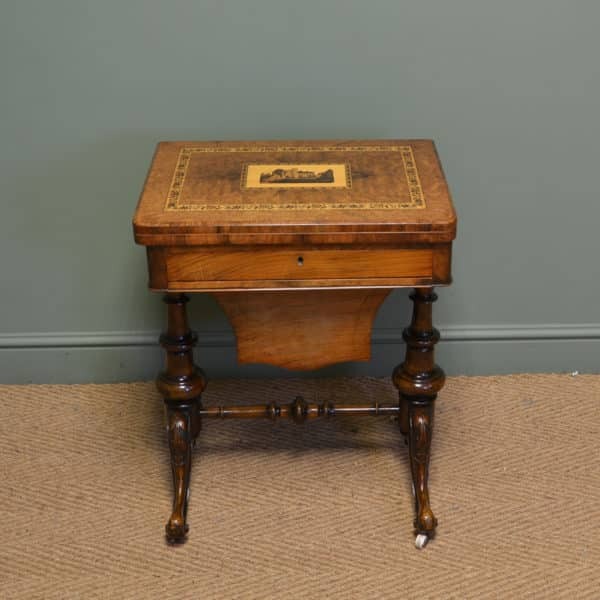 Dating from around 1860 in the Victorian period this rosewood antique occasional table has a secret to hide? 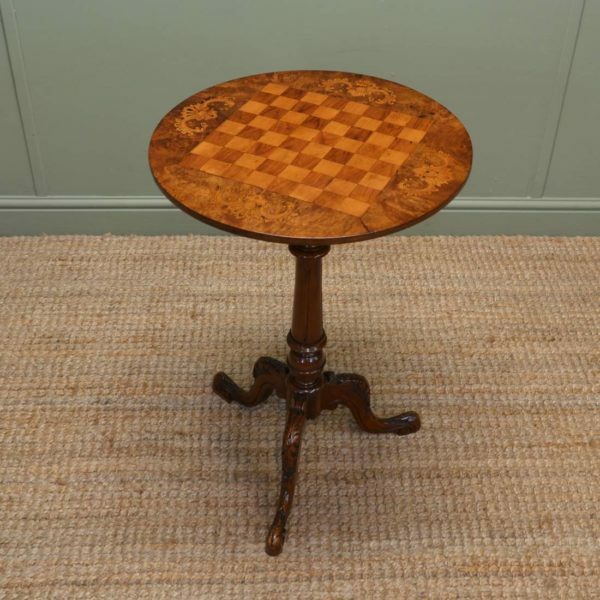 It has a beautifully figured moulded top which swivels and unfolds to reveal an unusual inlaid chess board below which sits a frieze drawer, ideal for storing playing pieces. The top is supported by beautifully scrolled sides with elegantly carved barley twist detail. It stands on four scrolled feet with small castors. 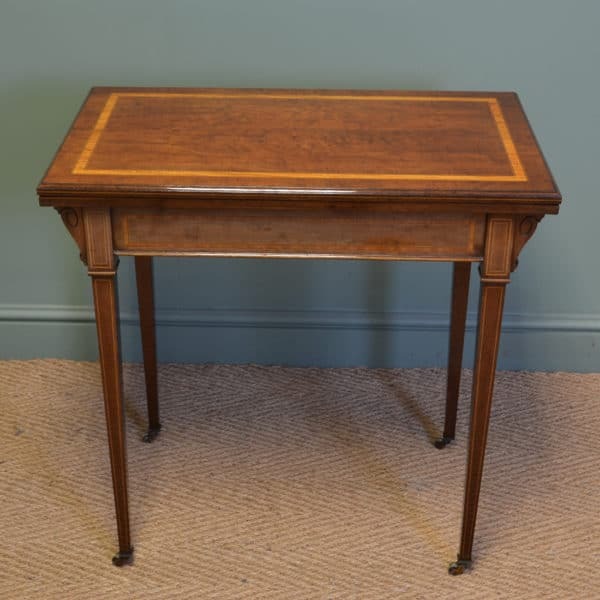 This very unusual and stylish antique occasional table / games table is a lovely rich, warm shade of rosewood with a striking grain, good patina, is in very good condition and has been beautifully cleaned using a traditional form of wax finishing. 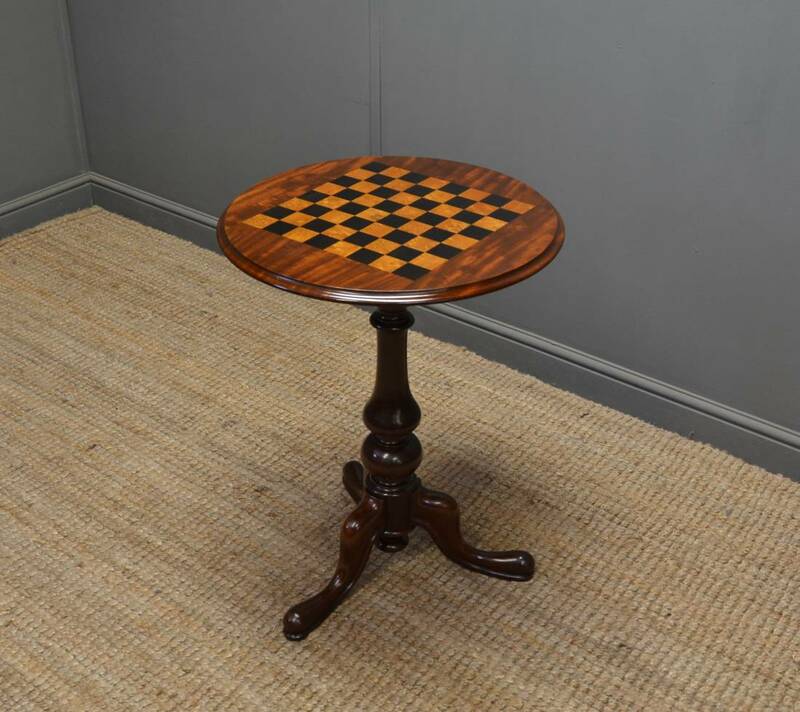 Quality Victorian Mahogany Antique Chess Top Table. Dating from around 1870 in the Victorian period this delightful mahogany side table is of superb quality. 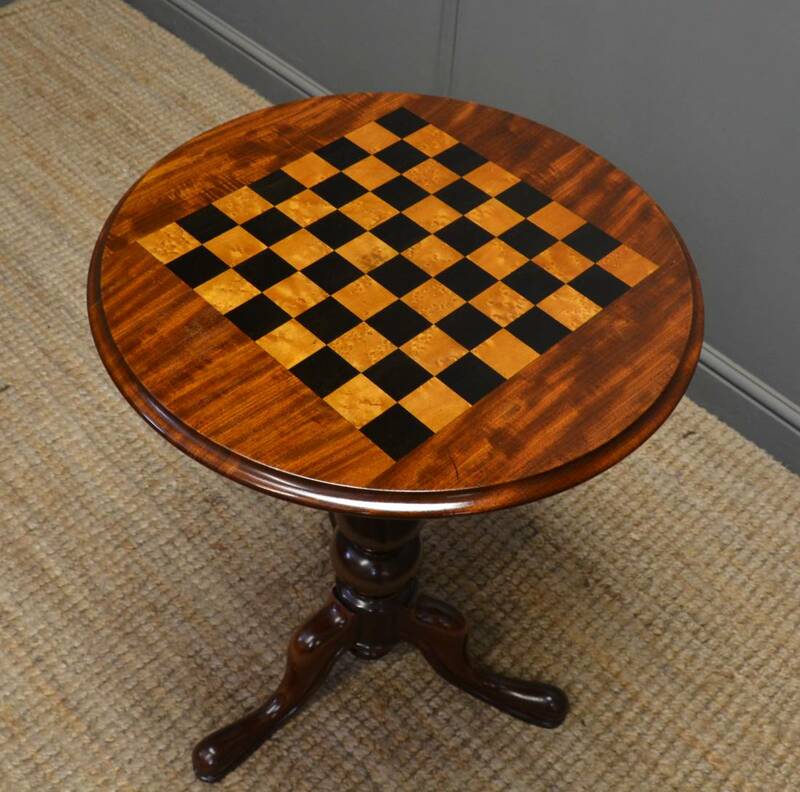 The circular moulded top has a very striking ebonised and birds eye maple playing surface, ideal for a game of chess. This is supported by a beautifully turned pedestal with three splayed legs and moulded pad feet. It also benefits from the added decoration of a central turned finial at the base.